This may be the last thing that anyone with a touch of ophidiophobia - fear of snakes - would want to hear: flying snakes have surprisingly good aerodynamic qualities. 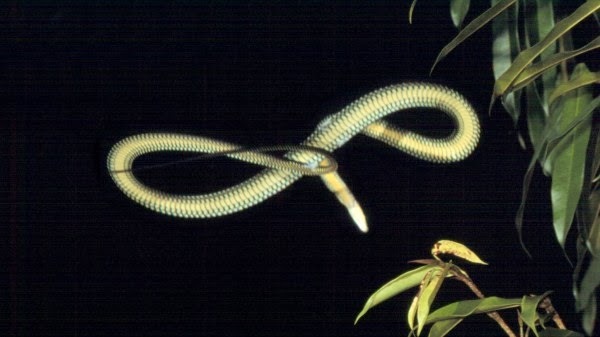 Scientists studying the amazing gliding proficiency of an Asian species known as the paradise tree snake say it does two things as it goes airborne. It splays its ribs in order to flatten its profile from round into a more triangular form, and it undulates while airborne - sort of swimming through the air. Researchers led by Jake Socha, an expert in biomechanics at Virginia Tech, replicated in a plastic model the shape the snake assumes while airborne, and tested it to evaluate its aerodynamic qualities.